If you’re a radio enthusiast, what could be better than having unlimited access to numerous radio channels from around the world? nRadio does just that by allowing users to stream radio stations by simply being connected to the Internet. Just how vast is the span of nRadio? Well, imagine being able to listen to radio stations from not only America but Canada, Germany, and the UK as well, to name a few of the ones available. nRadio offers full support when connecting to most radio channels in the said countries, but by no means is it limited to the said list alone. 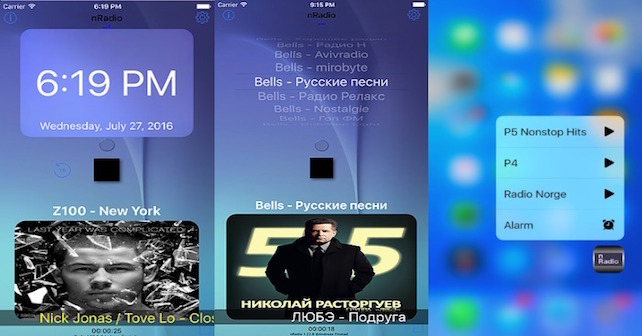 With this app, you can also discover what Polish, Greek, Spanish, Italian, French, Swedish, and Japanese radio is like. The app boasts of being able to offer support for 43 countries worldwide and over 20,000 radio stations. Since its developers are all too willing to let users add radio stations they know, assuming they know its address, it’s no surprise that the app has already reached such a plethora of available radio stations to connect to. You can start browsing and listening to the radio station immediately after launching the app with the use of 3D Touch. The app lets you save radio stations that you like to your Favorites list and share them with your friends anytime you like. It may not be able to connect to majority of the radio stations in other countries, but the very fact that you are able to experience the rest of the world’s radio stations could prove to be a feature that is already complete in itself. What’s certain is that any radio enthusiast would be treated to a smorgasbord of international auditory delights once he opts to use nRadio as his personal radio app. With that said, another noteworthy aspect is the ability to customize how you want your radio interface to appear. The interface is noticeably very simple, and you can easily edit its background as well as how you want the text elements to appear. You can personalize the colors of the text as well. Similar to a radio, the app reveals the time, radio station name and frequency you’re listening to, and even takes the liberty to display the album art (if it’s available) of the song you’re listening to. It also has a built-in alarm clock and a nightstand mode that allows you to wake up to your favorite radio station every morning. If it happens that you are using the app while driving, though, know that the developers of nRadio have also incorporated a speedometer. nRadio, if compared to other radio apps in general, clearly shines with its main feature of offering various radio channels from around the world. That, plus the features which make it highly similar to an actual radio only serves to make nRadio outshine its competitors.